Louisville quarterback Teddy Bridgewater finished the 2013 regular season with 28 touchdowns and four interceptions. The Michigan State Spartans are heading to the Rose Bowl behind the nation’s best rush defense, but the Louisville Cardinals — granted, while playing lesser competition (105th strength of schedule, according to Jeff Sagarin) — were not far behind in the statistical category, holding opponents to 86.3 yards per game on the ground. 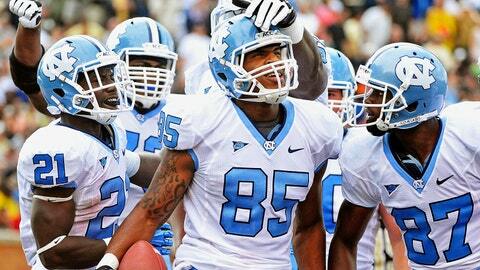 Can UNC finish the season on a high note with a win over the Cincinnati Bearcats? Only three teams consistently hurt Charlie Strong’s defensive unit while running the ball in 2013, with conference champion and Fiesta Bowl participant UCF being the only one to walk away with a win, rushing for 196 yards and three scores. The Cardinals (11-1) did not lose another game the rest of the way, holding South Florida, Connecticut and Houston under 75 yards rushing in the games immediately following the disappointing loss. In a strange twist, it was former Miami running back Storm Johnson — the UCF star that rushed for 1,015 yards and 11 touchdowns this season — that hurt the Cards most, becoming the only 100-yard rusher they allowed all season. The Hurricanes will need to find similar success without their own standout running back, Duke Johnson, who suffered a season-ending injury in the Florida State game. The bulk of the workload will fall on the shoulders of Dallas Crawford, who logged 100-yard rushing games against UNC and Duke, and freshman Gus Edwards. Both are capable backs, and Miami will likely need them to cross the 125- or 150-yard threshold to provide balance for the passing attack, where Louisville also ranks in the top-10 nationally. Not having a number of the team’s top offensive weapons in this one will hurt the Hurricanes, but Al Golden will have to find production wherever he can. A projected No. 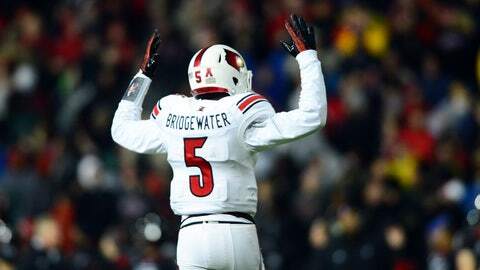 1 overall pick on some NFL Draft boards, the easy answer here is Louisville quarterback Teddy Bridegwater. Backed by a top-10 defense, the junior may not have contended for the Heisman past the season’s halfway point but he still played very, very well. He passed for more than 3,500 yards to go along with 28 touchdowns and four interceptions. Cardinals running backs Dominique Brown and Senorise Perry provide enough of a running game to balance out Bridewater’s aerial talents, so do not expect the Hurricanes to be able to simply key in on stopping the preseason All-American. He’ll get his opportunities and he’ll want to make a statement — much as he did last year in torching a loaded Florida defense for 266 yards and two scores in a Sugar Bowl victory. This game falls a bit lower on the bowl totem pole, but this is a showcase game for both Bridgewater and his program, a future ACC member alongside Miami. Expect a strong performance. 3: Louisville’s defense has allowed just three 300-yard passers since Charlie Strong arrived in 2010, and the only player to do so this season (Cincinnati’s Brendon Kay) threw two interceptions and zero touchdowns. The only other teams to hit the mark against the Cardinals? High-flying spread attacks led by Dana Holgorsen (West Virginia) and Larry Fedora (UNC). Miami does not feature the same type of scheme or firepower. This could be a quieter day for QB Stephen Morris. Louisville’s preseason ranking may have been a bit lofty, but Miami’s run into the national top-10 was based on a mirage. The Hurricanes struggled in the games leading up to their comeuppance against Florida State and failed to log an impressive win in the aftermath, losing to Virginia Tech and Duke before beating Virginia and Pittsburgh. Overall, four of the Hurricanes’ seven wins against AQ conference teams were decided by 10 points or fewer. Still, Louisville has the edge on both sides of the ball until proven otherwise, and Strong’s staff proved it can get a team ready for a bowl game last season. Will this be the Cardinals’ grand entrance into the ACC?